I was watching Geoff Hamilton and he made a lollipop shape out of a apple tree,I would like to know if I could do the same with a plum tree. I haven’t seen the video and I can’t find any information about this apple tree so I have no idea what it looks like. Firstly, could you show us an image of it? Secondly why? What is the attraction? Pruning to a lollipop shape isn’t really going to be the best way to encourage fruiting. I just like the design and it is compact but geoff did it with apple tree I am wondering if I could do it with a plum tree as I am just starting a maiden of. Ah, I vaguely remember that ... not a lollipop like a standard bay. Its more like espalier training over a frame. I dont see why why it couldn’t be done with plum with a bit of effort. 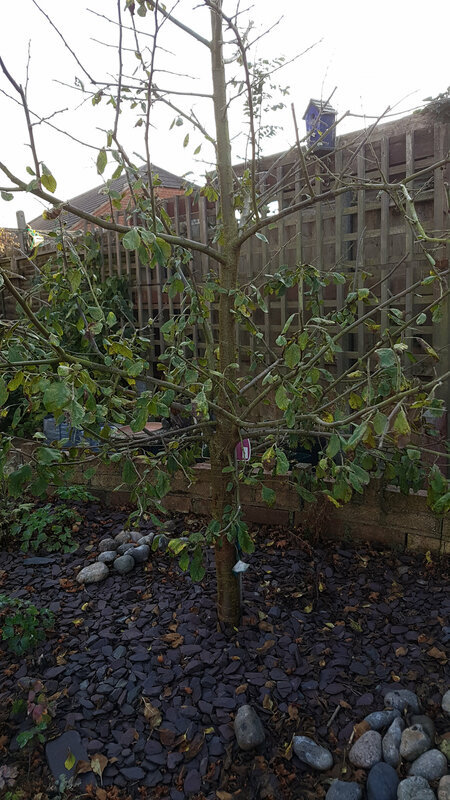 Over the last three Years I have trained my plum ( which is on a petite root stock) in a christmas tree shape which I found when searching online. My main aim was to ensure a tiered succession of stems with good airflow between, so chose the first and second rows to keep, and weighted the ends with twine and bricks, they stayed like that for a year until set and then were released. While this was setting the new growth was trained and trimmed to shape and weighted, so now have a full grown tree to the shape and size I wanted. In the 19th century the French were famous for training all sorts of fruit trees into the most elaborate shapes, so I guess it should be possible as Dove says. A bit of reseach would probably yield a book or two on the topic.